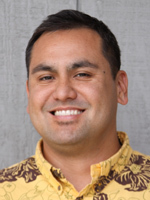 The Food Basket, Inc. (also known as Hawaii Island’s Food Bank) has appointed En Young to be the new executive director for the agency. Young will oversee operations, agency relations, and development for The Food Basket islandwide. “We would like to thank all of our community partners for your generous support and patience throughout this transition. We are fully confident that once we acclimate to our new facilities and leadership that these will translate into improved services to our partner agencies, neighbors, and friends” Young said. He succeeds Dr. Nani Lee following her retirement in November 2012. Young is returning to the Big Island, where he was born and raised, having previously served as the contract, performance, and evaluation administrator for the state Office of Community Services. In this capacity he oversaw a variety of State and Federally-funded programs designed to alleviate poverty, including supervision of the U.S. Department of Agriculture Emergency Food Program and the Senior Farmer’s Market Nutrition Program. The Food Basket, Inc, is a 501(c) 3 non-profit that manages an island-wide, supplemental food network that collects and distributes nutritious, high quality food to low income households, the working poor, the disabled, the ill, senior citizens, and children. The Food Basket serves communities throughout Hawaii island, including difficult to serve areas such as Hawi and Ocean View, through a blend of publicly and privately-funded programming. meal soup kitchens, seniors in need, schools, and other businesses, non-profits, and individuals in the community wishing to help the Food Basket alleviate hunger in Hawaii County. For more information, call The Food Basket at 933-6030.